Published April 30, 2013 By Anna T. This post may contain affiliate links. Regardless, I only recommend sites I've researched and/or used and trust. Connect and Sell is a company offering an interesting little work from home position. 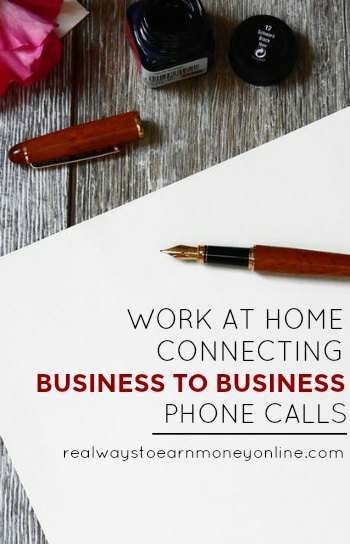 What this company has you do is connect phone calls for business to business/sales companies. This frees up time for busy salesmen because when a call comes through to them, the customer they were trying to reach is already on the line, waiting to speak to them. You contact the customers and then when someone is on the line, patch them through to the salesman. But you don't actually have to talk to anyone, apparently it is all automated. Using our on-line tool, Experts will initiate outbound calls to prospective customers and ask for the listed contact. Once the customer comes to the phone, the Expert will immediately transfer the call to the appropriate sales professional. Expert will not speak directly to the customer. Each pre-scheduled work hour will pay $10 plus potential bonus for successful connections. Connectandsell accelerates the process of connecting to new or existing prospects that companies' sales team are working to close. We do this through a combination of patented switching technology and virtual sales agents so that when we connect to a prospect, the prospect believes that the company's sales rep has made the call. Connectandsell's agents never speak to prospects directly. This service enables sales reps to spend all of their productive time presenting the product or service. We appreciate your time into exploring details about our company on our website : www.connectandsell.com. Hard wired connection is required to have at home. Payment is weekly via Paypal (see more weekly pay work at home jobs here). It's an independent contractor position. This job was originally offered at LiveOps through their LiveWork platform. They hire people in small batches. There are some interesting Connect and Sell reviews online. Some people state on various work at home forums I frequent that they enjoy the work and pay is accurate and on time. I also read where another person quit after just one week, not happy with things. As it is with anything, reviews will vary. You can always do a search on Glassdoor for reviews of Connect and Sell to get an overall feel for what people think of their jobs. As stated above, they are not actively hiring for this position right now, but you can always forward them your resume at careers@connectandsell.com so that perhaps they may contact you at some point in the future. Hi Anna, I left a comment for you on SITS, but I wanted to let you know that I subscribed via email and I shared your site on FB. I think what you are doing here is really great! You are an advocate for so many of us searching to be home with our families and make the money necessary to support them.